SaaS-based market intelligence firm InsideView Inc, which develops some of its global offerings from a product development centre in Hyderabad, has raised $32.5 million in equity and debt funding from Spring Lake Equity Partners and existing investors. InsideView's investors Big Sky Partners, Foundation Capital, Rembrandt Venture Partners and Split Rock Partners also participated in the latest round of fundraising, as per a press statement. InsideView will use the money to invest in marketing products, create application programming interfaces (APIs) and strengthen its big data platform. "We are seeing more traditional industries like commercial real estate, banking and manufacturing adopt our products to gain an advantage in their increasingly competitive markets. We chose Spring Lake because of their vast experience with later-stage growth companies and their connections to Wall Street. Working with them brings us closer to an important market like financial services and helps us prepare for our future," said Umberto Milletti, CEO of InsideView. Jeff Williams, partner at Spring Lake will join InsideView's board of directors as part of this transaction. InsideView has now generated external funding of over $80 million, the company said. The San Francisco-headquartered InsideView was founded in 2005 by Milleti. Its products are used by more than 20,000 companies to fuel sales and marketing parallels. The company aggregates, triangulates and validates company and contact data, social and news insights, and business connections from over 40,000 sources. InsideView's Hyderabad development centre builds market intelligence tools used by clients in commercial real estate, banking and manufacturing sectors. 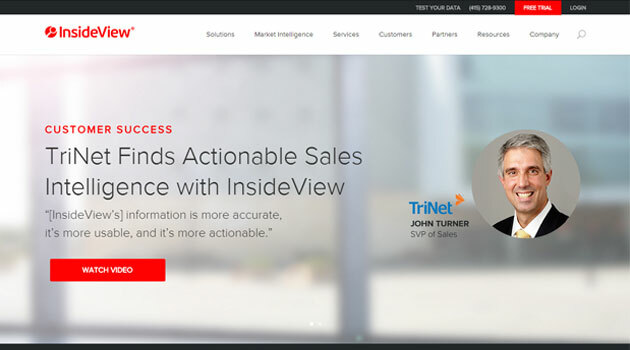 "InsideView's power is using intelligent data to provide companies with a consistent, unified view of their market opportunity to align sales and marketing for greater revenue performance. That's why it is leading the market and we chose to invest," said Williams, partner at Spring Lake Equity Partners. Spring Lake Equity Partners is a Boston-based private equity firm which invests in later-stage and technology-oriented private companies.